Blueberry cheesecake, especially in mini form, is a favorite dessert of mine. I love simple recipes that are quick to throw together, and this blueberry cheesecake recipe is perfect. This gluten-free blueberry cheesecake is made with cashews and a vegan cream cheese alternative. 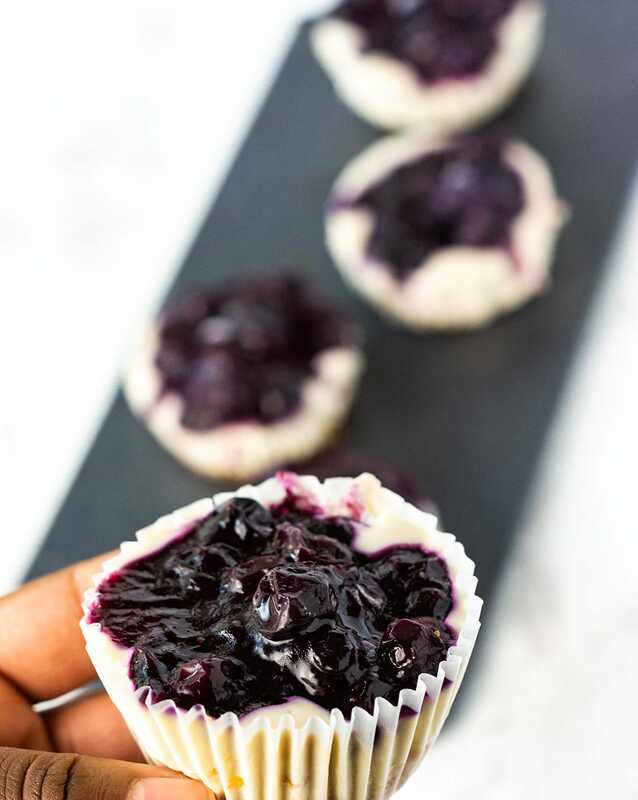 With an active prep/cook time of about 20 minutes, the only part that requires your patience is waiting for this delicious blueberry no bake dessert to set. 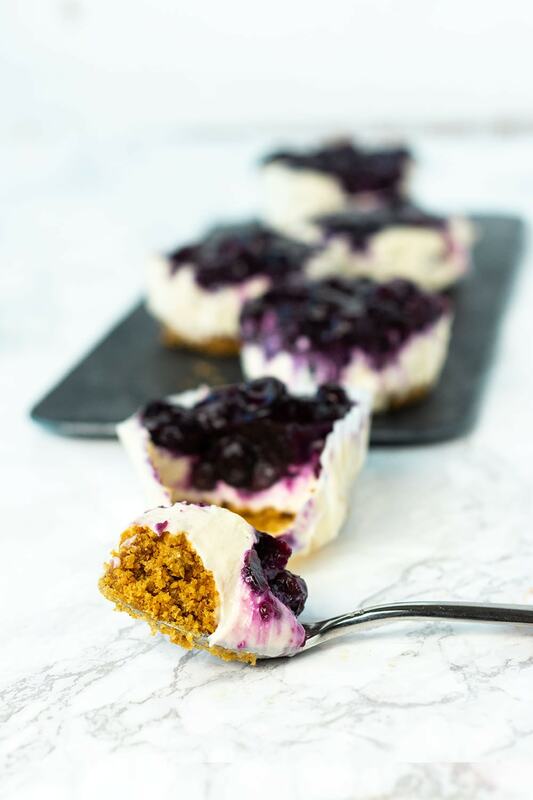 This easy blueberry cheesecake is perfect for entertaining because of how low maintenance it is, and can easily be made to fit your needs. You can make a blueberry cheesecake pie, mini blueberry cheesecake, or even blueberry cheesecake bars. I chose to make mini blueberry cheesecake to change things up, and they are adorable. 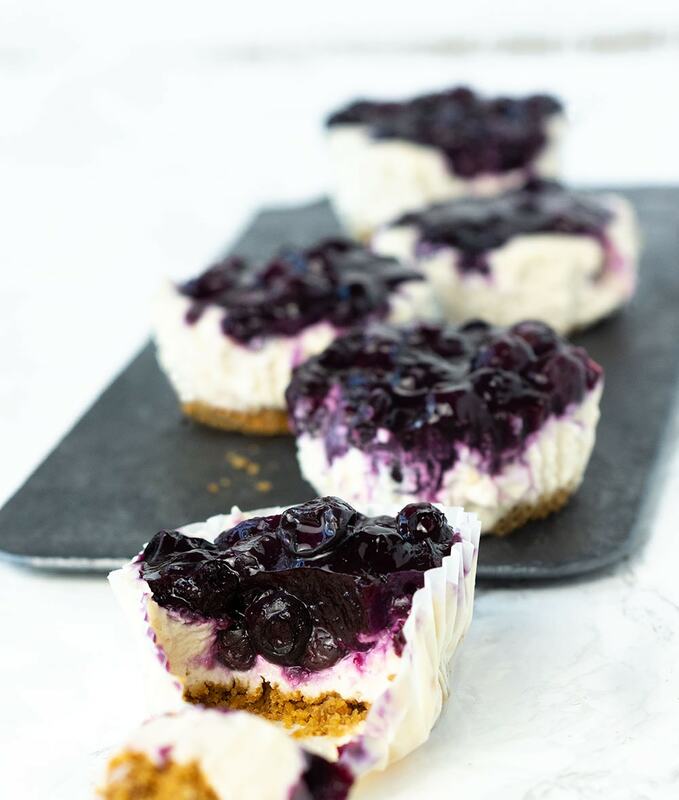 And remember, this is a no bake blueberry cheesecake recipe, so it's perfect for the upcoming summer months if you don't want to heat up your kitchen. Graham cracker crust - using this graham cracker recipe or your favorite store-bought brand. 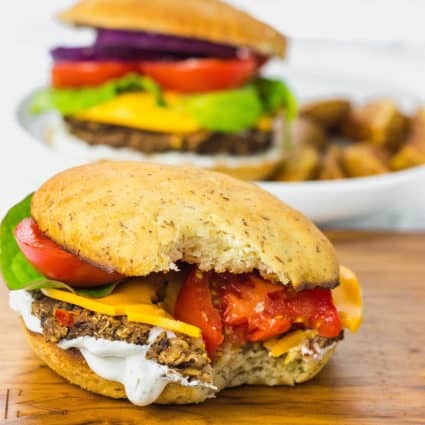 Vegan cream cheese Substitute - your favorite brand of cream cheese is what helps to thicken the cheesecake filling and lend additional creaminess. Coconut oil - my little secret ingredient that helps this blueberry cheesecake to solidify without adding cornstarch or other thickeners, and helps the texture instead of making it worse. Blueberry topping for cheesecake - no explanation needed, it's the best part. How to Make Blueberry Cheesecake? In my opinion, this is one of the easiest dessert recipes ever. Just make your graham cracker crust, which comes together in under 10 minutes, make your blueberry sauce for cheesecake, and your vegan cheesecake filling. Put it all together and voilà, enjoy your blueberry cheesecake dessert! 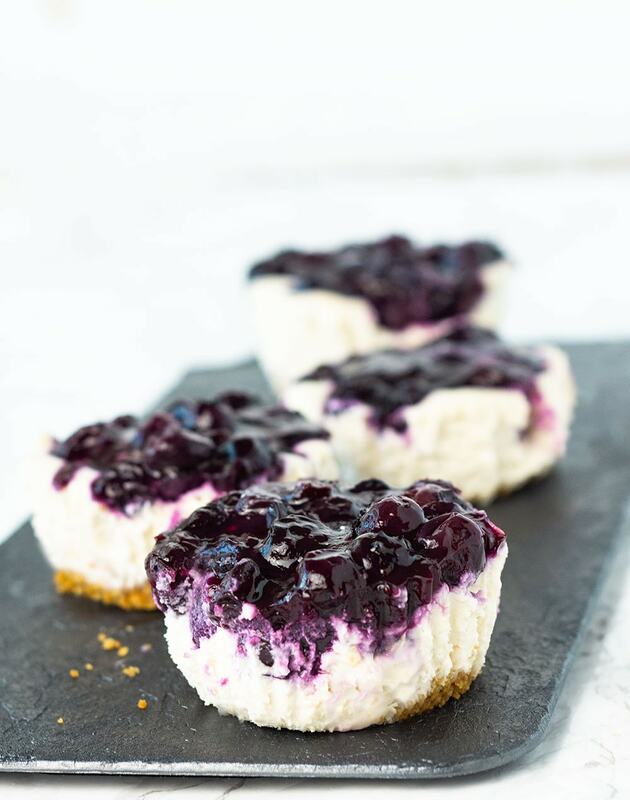 How to Make Blueberry Topping for Cheesecake? The blueberry topping for cheesecake recipe, which can also be used for any other no bake dessert, is actually quite easy to make. Basically, just put all the ingredients in your saucepan and cook while stirring until it's nice and thick. Once it's cooled it will set to a gel like consistency. Yes, and I actually recommend it, especially if you are entertaining. 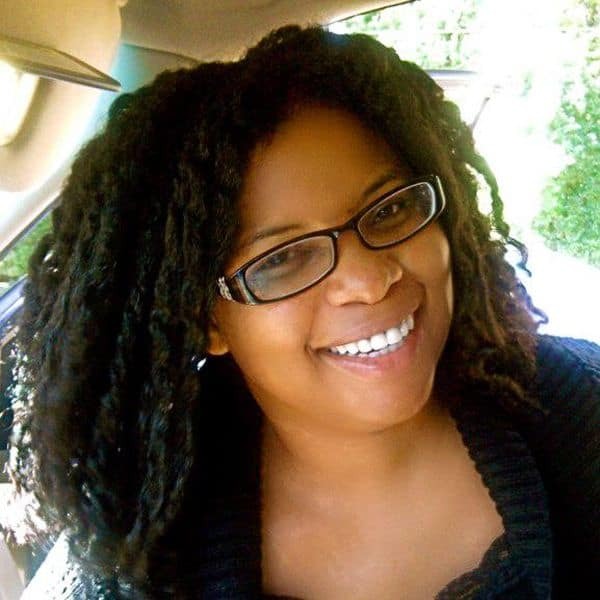 This the perfect party, cookout, or family gathering recipe. You can make it a day or two ahead, then take it out 45-60 minutes before you serve it, and it will be creamy but hold it's shape, therefore inspiring very Instagram worthy shots from all your guests. You can also make a batch of mini cheesecakes, freeze them separately, and take out one or two for dessert when you don't feel like cooking, and save the money you'd spend buying storebought desserts. This recipe does not take much of your time in the kitchen. Most of the time is spent waiting for ingredients to cool, cook, or for the blueberry cheesecake to set. Most of the ingredients are common, especially in a vegan kitchen. They also can be easily substituted. This easy blueberry cheesecake recipe freezes very well, and defrost into a weird mess. You can have it in your freezer as a treat, and not feel like you need to eat the entire batch in one sitting (even though you'll want to). In conclusion, I feel that this is the best blueberry cheesecake recipe ever, and I believe you will too. 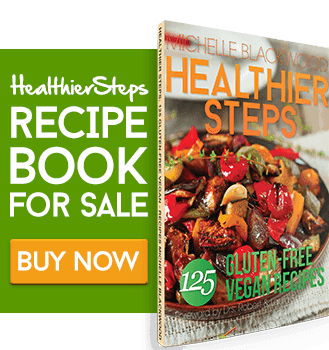 If you make this no-bake blueberry cheesecake, snap a photo and hashtag #healthiersteps — we love to see your recipes on Instagram, Facebook & Twitter! Crumble graham crackers by pulsing in food processor until finely crushed, or alternatively, place in plastic storage bag and pound with a hard object, such as a rolling pin. Prepare your baking dish. This recipe can make a standard pie, about 15 muffin sized mini pies, or 12 mini pies. 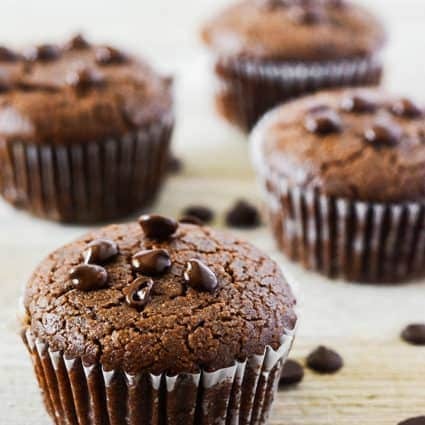 If you are using a muffin pan, use cupcake liners for ease of removal and extra cute factor. Mix the graham cracker crumbs and butter in bowl, then add to container. The mixture will be quite crumbly, but will come together with you pressing on it. Place in preheated oven for 5 minutes. Remove and let cool. Mix sugar, water, cornstarch, and lemon juice in a small saucepan. Set stove to medium heat, and wait until it starts to bubble, stirring constantly. Add blueberries, and continue stirring. When it starts to bubble, keep stirring as the mixture gradually thickens. If it starts to boil, turn down the heat. Continue cooking on medium-low heat for about 10 minutes. Set aside and let cool. Add milk and sugar to saucepan and heat on medium until it starts bubbling and the sugar melts into the milk, while stirring constantly. In the blender, add milk mixture, cashews, lime, vanilla, and coconut oil, and blend. Pour filling into your prepared crust until a little over half full. Let it sit for about 30-60 minutes, or until the mixture is soft set. This ensures that the blueberries will not sink to the bottom, but that the mixture is still soft enough for them not to be sitting on top either. Spoon blueberry filling on top, and put in refrigerator or freezer until set. I personally recommend freezing, and then letting defrost for about 20 minutes for minis and 45 minutes for a pie. This is especially a good method for entertaining, because this guarantees that your cheesecake will not be soft and messy to handle. On the other hand, if you love soft creamy delicious desserts, letting it set in the fridge will give it more of a creamy pie texture. This will work especially well with mini cheesecakes. I buy unsweetened original flavored milk, because personally I use milk more to cook than to drink. This makes it easier for me to use in savory recipes, and if I do feel like drinking some I can just add some sweetener and vanilla. In this recipe I used Silk Cashewmilk Unsweetened Original, but your favorite plant-based milk alternative will work just fine. If you happen to just have sweetened vanilla available, that’s just fine, but use 1 tsp of vanilla instead of 2, and you may want to adjust sugar to taste (but not by very much). Quick soaking cashews: I recommend soaking cashews overnight, but this is not always possible. Don’t worry, your recipe won’t be derailed! Boil enough water to cover the cashews in a small saucepan. When it comes to a boil, turn off heat and add cashews. Cover and soak for 30 minutes. You may have to blend the cheesecake filling an extra time or two. 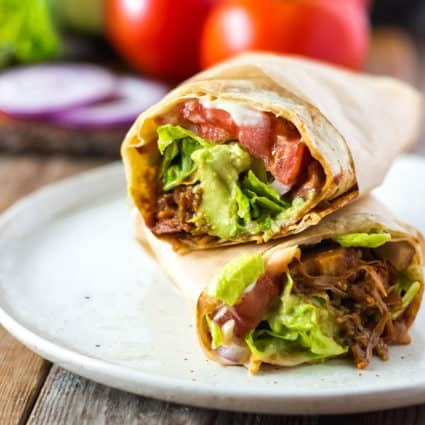 Lemons can definitely substituted for the lime in this recipe. It’s not the main flavor, just there for subtle acidity to cut the sweetness and richness of the filling. The reasoning behind me warming the milk and sugar is so that nothing is straight from the refrigerator, and cold enough to make the coconut oil solidify before it can be fully blended into your other ingredients. Make sure your cashews are at least room temperature if you’ve soaked them overnight.